This 10-CD box was originally planned by BMG as a handsome tribute to mark the 90th birthday of Günter Wand in January 2002. Sadly, Wand died on 14 February 2002, barely a month into his 91st year and the set thus becomes a very fitting tribute. Though it is not BMG�s fault, the set cannot give us a full picture of the career of Günter Wand (1912-2002). As the comprehensive notes make clear, during his earlier career he conducted a great deal of opera and also a much wider repertoire of concert music than is represented here. However, he only began to record for BMG/RCA in the 1970s by which time he had narrowed the focus of his work. In his later years he preferred to concentrate largely on the music of the great Austro-German masters: Beethoven, Brahms, Bruckner, Mozart, Schubert and Schumann and his forays outside this core repertoire were increasingly rare. Furthermore, he increasingly eschewed working with soloists in the concerto repertoire. Accordingly what we have here is a pretty fair representation of his later years. Wand only came to any real prominence outside Germany in the late 1970s and so it may be worthwhile reprising his career briefly. Born in Elberfeld in 1912 his principal musical studies were at the Cologne Conservatoire. After spending his first years as a conductor working in some of the smaller German opera houses (a classic training at that time) he joined the Cologne Opera in 1939 until the opera-house was destroyed in the war in 1944. After a brief sojourn in Salzburg, conducting the Mozarteum orchestra, he returned to Cologne in 1945 as Musical Director of the Opera. In the following year he assumed the direction of the Cologne Gürzenich concerts and he remained at the head of Cologne�s musical life until resigning in 1974, perhaps prompted by speculation that the city authorities were looking for a younger man to lead the city�s music-making. In the following years he worked as a freelance and one of the orchestras he directed was the NDR Symphony Orchestra based in Hamburg. In 1982 he became that orchestra�s chief conductor. In the previous year he had made a most auspicious debut with the BBC Symphony Orchestra which led to an appointment as Chief Guest Conductor there. Even after relinquishing that post he continued to make annual visits to the BBC and was an honoured guest at the Proms as well as at the Edinburgh Festival. In his last years his concert appearances were inevitably reduced but became a "hot ticket" wherever he appeared. This issue from BMG is most welcome. However, let me get my one complaint out of the way at once. The set comes with a booklet of no less than 248 pages containing comprehensive notes on Wand by Wolfgang Seifert, the conductor�s biographer. There are also notes on the individual works. The notes are extremely thorough (if tending too much towards hagiography at times). Unfortunately the English translation (the text is only in German and English) is a very poor affair indeed and much of it is extremely difficult to read sensibly. There are also a number of small factual slips. A pity that this otherwise worthy project is compromised in this way. However, the music is the main attraction here and this box contains some riches. The notes state that this is a concert performance from 1971 but then go on to say that Wand first conducted the work in 1974 (the latter date is correct, I believe and it is from 1974 performances that this recording derives). Wand recorded the piece on two subsequent occasions, both �live� recordings, firstly with the NDR Symphony Orchestra in 1989 and subsequently with the Berlin Philharmonic (a version which I have not heard.). The present performance is presumably preferred here because it is, apparently, Wand�s first Bruckner recording. In the first movement, after the slow introduction (unique in Bruckner) Wand directs an urgent account of the main allegro. It is when the first climax is reached that my chief reservation arises. The brass, and the trumpets in particular, are bright almost to the point of stridency and this is a recurring feature throughout the recording. It was only in March that I reviewed Wand�s recording of the Bruckner 8th where there were no such excesses from the brass; I suspect that here the players were simply too enthusiastic. Comparisons with the 1989 NDR recording showed that in this respect at least the later account is much preferable. What cannot be doubted, however, is Wand�s mastery of the score in this 1974 account. Bruckner is one of those composers who signposts transitions almost to the point of saying "here is a new paragraph". This can make his music sound episodic but there is no such danger when Wand is on the podium. All transitions are negotiated smoothly and without attracting attention. On the evidence here, even as a "newcomer" to Bruckner in 1974, Wand was exceptionally good at sculpting a Bruckner adagio, giving the music the necessary gravitas while allowing it to flow. This is a most satisfying performance of the slow movement. So, too is the account of the scherzo though here I felt that in the 1989 performance Wand�s touch seemed just a shade lighter. The massive finale is easily the longest of the four movements. It is also extremely complex, incorporating a double fugue after an introduction in which, in the manner of Beethoven�s 9th, earlier thematic material is recalled. I think that Wand�s is as fine an exposition of this demanding movement as you are likely to hear. He makes everything hang together and in the fugal passages all the strands of the argument register because he balances the textures so well. The final peroration is imposing but once again is slightly marred for me by the dominance of the brass. Again, the 1989 recording is to be preferred and the greater restraint of the NDR players does not result in reduced excitement. Interpretatively, there is little to choose between these two Wand recordings. Other than my reservations about the Cologne brass both accounts are well played. Anyone investing in this box who already owns the NDR recording should not discard it. Nonetheless, this performance by the "young" Günter Wand (he was 62 at the time) is an imposing one and makes an auspicious start to this collection. As you may guess from the fact that all these three symphonies are fitted onto one CD, Wand is selective in the observation of repeats. These performances are also "big band" readings. However, neither factor should diminish admiration for the contents of this disc. There is absolutely nothing sluggish about any of the performances. The minuets of Nos. 39 and 41 may strike some listeners as stately (though that in No 40 trips along delightfully); however, I rather like these speeds. In fact, it seems to me that most of Wand�s tempi are judiciously chosen. Perhaps the speed for the first movement of No 40 would have benefited from a bit more �lift� but even there I must admit that the pace which Wand sets conveys the dramatic pull of the music very well and it allows plenty of clarity in the part writing. Throughout the disc the playing itself is alert and spruce, phrases are well turned and the rhythms are consistently well articulated. I particularly enjoyed the performance of the �Jupiter�. The first movement has an exuberant, festive air. The second movement is marked andante cantabile (my emphasis) and under Wand�s direction the music really does sing. The effervescent counterpoint and sheer brio of the finale are brought out to the full, concluding a most enjoyable CD. These days we are much more accustomed to hearing Mozart played on period instruments or by chamber orchestras. I much enjoy such accounts. However, there is a danger that performances by full symphony orchestras will become an endangered species. These readings by Günter Wand demonstrate that with proper preparation, stylish playing and skilful, idiomatic conducting these works can still be played most effectively by a modern symphony orchestra. These are winning performances, which I enjoyed enormously. The resulting Serenade, in eight movements is on a grand scale (rivalled in Mozart�s output in this genre only by the �Gran Partita� serenade for 13 wind instruments, K361). Though such pieces were designed to provide pure entertainment (and often were heard as background music) here Mozart provided entertainment while paying the Haffner family the compliment of doing it through music which has genuine depth. As with the symphonies reviewed above, Wand directs well-shaped performances and generally chooses appropriate tempi. However, as the performance progressed I did wonder if perhaps he had focused just a little too much on the more serious side of the music. Could he not, with advantage, have lightened up just a little? The full toned orchestra which I enjoyed so much in the symphonies is, I feel, somewhat less appropriate on this occasion. In the notes we read that Wand "understands � as hardly any other conductor - how to bring this music to life, with loving and detailed perfection, and to reveal its charm." Well, leaving aside the rather absurd comparison with other conductors (what about Beecham and Mackerras to name but two stylish rivals?) it seems to me that this particular performance does little to reveal Wand as a conductor of charm. One has only to revisit the previous CD (the finale of the �Jupiter�, for instance) to appreciate that he did have the ability to conduct with a twinkle in his eye. However, here I think the impression which is conveyed is that of entertainers on their collective best behaviour at a party. There is much to enjoy and admire in this performance, not least the sweet-toned playing of Roland Greutter in his substantial concertante role. However, in the last analysis I feel that this is one of the few items in the collection which does not quite merit the accolade "essential". The coupling finds Wand outside what many would regard as his core repertoire (at least in his last couple of decades). The inclusion of �Pulcinella� is, however, a reminder that in his earlier years he programmed a good deal of twentieth century music. The suite recorded here is the later, 1949, version in eight movements rather than the original 1921 suite, which had thirteen movements. Although the recording is billed as being by the NDR Symphony Orchestra the notes tell us that Wand uses "chamber music instrumentation and soloists of the NDR Symphony Orchestra." Certainly, the string section sounds to be considerably slimmed-down by comparison with the forces deployed in the �Haffner� Serenade, with consequent benefit, I feel. This seems to me to be a trim, buoyant account of the suite. I did notice a few occasions where ensemble did appear not to be entirely unanimous but I really don�t think such minor matters detract from the overall success of the enterprise. It�s most interesting to hear Wand "off the beaten track" and to such good effect. Disc 4. BEETHOVEN: �Choral� Symphony. This is a work which has clearly been of central importance to Günter Wand. He first directed it in January 1947, early in his association with the Cologne Gürzenich Orchestra, in arctic conditions which are graphically described in the notes. Remarks by Wand are quoted at some length, in the course of which he discusses one point of detail in each of the first and last movements. From this alone it is evident that he studied the score (as usual) in minute detail over many years - yet this performance sounds anything but studied. In that same quote he writes: "When we talk about Beethoven�s 9th Symphony today, then it is almost always about the choral finale. In contrast. the enormous symphonic conception of the first movement has always fascinated me." Even if one had not read these remarks beforehand I think Wand�s approach would still be obvious from the performance itself for here the first movement has real authority, grip and fire. It is a dramatic reading which commands the listener�s attention right from the outset and which retains that attention throughout the quarter-hour span of the movement. The scherzo bowls along on crisply articulated rhythms; the trio is equally fleet-footed but never sounds rushed. The luminous adagio is presented with serene gravitas and nobility. This is an essentially simple account of that movement for Wand has the confidence not to get in the way of the music and he just lets it unfold. (Time and again in this set one realizes that Wand is especially masterful in slow movements.) Wand has noticed Beethoven�s direction �cantabile� and encourages his orchestra to play with singing tone. In particular, there are some nicely burnished contributions from the woodwind principals to savour. I felt the opening instrumental recitatives of the finale sounded a bit slack. There seems to be an absence of electricity and tension. However, Wand presents the �Ode to Joy� at its first appearance on the strings at an appropriately flowing tempo (it is marked Allegro assai and not all conductors have the wisdom to play the passage without portentousness). The bass soloist, Roland Hermann opens the vocal part of the proceedings splendidly and the choir is a good, full-throated body of singers (I suspect they are professionals). All the soloists impress, Keith Lewis giving a forthright account of his big solo, although I did wish they had agreed on the pronunciation of the word �Elysium� � a small point, perhaps, but the word does crop up quite a bit. The balance between the chorus and orchestra is nicely judged by the engineers, with neither allowed to submerge the other. The choir itself is also well balanced internally. This is what I would term a �central� performance. I have heard others which equal it or which surpass it in some way or other. However, this is a rounded, well-considered and mature traversal and one which is, unsurprisingly and thankfully, shorn of any eccentricities. It is a performance of understanding and insight: one to live with. The main item on this disc is another of the fruits of Günter Wand�s relationship with the Berlin Philharmonic. In December 2001 I reviewed an earlier recording by Wand (with the NDR Symphony from 1984). This Berlin recording has all the virtues of its predecessor. It is well shaped, caringly phrased and the rhythms are lively. The structure is cogently held together, as one would expect from a conductor who handles the Bruckner symphonies with such mastery. Repeats are not made in the outer movements but, personally, I can live with this. Really, Wand and his players are masterly throughout. The vital oboe solo in the andante has marvellous poise and piquancy but, then, all the other wind principals pick up that particular gauntlet from their colleague and caress Schubert�s long-breathed phrases. This is a symphony which the Berliners must have played countless times but the whole performance sounds fresh and new-minted. Wand himself mixes elegance and drama in just the proportions that Schubert requires. This is a reading of great insight and � a word I keep coming back to � experience. Yet Wand�s art is one which conceals art and one is conscious only of the music being laid before us in an absolutely natural way. This is, quite simply, a magnificent, burnished recording, one which is full of incidental delights but which never loses sight of the "big picture". I bought this recording when it first appeared and rehearing it now has only increased my admiration for it. This is one of the key performances in this set. The fill-up consists of three movements form Schubert�s incidental music for �Rosamunde�. I don�t wish to sound dismissive but, good as it is, this Cologne performance from the early 1970s is not in the same league as the performance of the symphony. The orchestral playing is perfectly acceptable but it lacks the spark and distinction of the BPO (the Cologne recording is a studio account whereas the Berlin performance is �live�). Furthermore, to be frank the music is pretty run of the mill. I would not have felt short changed if the towering performance of the symphony had been the sole item on this CD. Nonetheless, the �Rosamunde� performance is a good one and Wand�s credentials as a Schubertian are very well served by this disc. This CD contains what are probably Schumann�s two finest orchestral works. So far as I know Wand recorded little of his music (I am not aware of any other Schumann recordings in the catalogue) but this disc suggests he was a pretty formidable interpreter of this composer. In the �Rhenische� the opening lebhaft movement is delivered with tremendous sweep and energy. The ebullient, heroic main theme rings out commandingly (splendidly imperious horns!). The whole movement is full of verve and I found it bracing. Schumann�s allegedly "thick" orchestration has often been criticised but Wand�s airy account of the scherzo ought to lay that particular charge to rest. There is light and shade a-plenty here to prove that a master conductor can easily clarify "thick" orchestration. Some most decorous and refined playing, especially from the woodwind, graces the third movement. Wand handles the �Cologne Cathedral� fourth movement splendidly. He imparts an intense glow to the music and builds it to an impressive central climax. The joyful, open-air exuberance of the finale is caught most successfully. Altogether, this is a most distinguished rendition of this delightful symphony. Its companion, the more dark and dramatic Fourth strikes me as no less successful. The booklet notes refer to the influence of Beethoven and in Wand�s hands this is particularly pronounced in the introduction to the first movement, which he lays out with fine intensity. After this the main body of the movement is unleashed with potent energy. A simple restraint characterizes the performance of the romanza while the scherzo is splendidly alive, with just the right degree of lyrical relaxation for the trio. The pregnant transition to the finale is superbly realized. There is real mystery and pent-up energy here. Again, as this passage builds one is conscious that the conductor excels in Bruckner. Then comes the moment of release and the vigorous finale erupts, carrying all before it. This, then, is an exceptionally fine coupling of masterful accounts of both symphonies. The recordings were originally issued separately, each coupled, I believe, with a Schubert symphony. I hope that in due course BMG will release this present CD separately for it would be a most attractive and self-recommending issue. This recording of the Brahms symphony is of especial interest, apart from its musical merits. Not only does it preserve Günter Wand�s debut with the Chicago Symphony Orchestra but also I believe it is his only commercial recording with a non-German orchestra. The performance took place in 1989. Wand programmed the Brahms symphony and Schubert�s �Unfinished� Symphony. Even for such staple repertory he demanded, and got, no less than eleven hours of rehearsal! That the time was put to good use is readily apparent. The reading of the symphony�s first movement is powerful and dramatic, with a purposeful, quite swift pulse for the introduction. Accents are sharply pointed and rhythmic points are pressed home (though never excessively) The whole movement and, indeed, its successors, is underpinned by a strong sense of line, so crucial in Brahms. The andante is lovingly shaped; a rich carpet of strings prepares the way for a beautifully plangent oboe solo. Later in the same movement there are contributions of equal distinction from the solo horn and violin. The third movement may disappoint slightly. It strikes me as a little too serious in tone, lacking the grazioso element requested by Brahms. The finale, however, is an unqualified success. After a searching introduction the solo horn rings out as though across a great alpine valley. In this passage the Chicagoans, excellent throughout, surpass themselves in terms of eloquence and responsive playing. The great string tune is given out with noble dignity and wondrous depth of tone. When the main allegro s reached Wand and his players attack it with all the �brio� Brahms could have desired. This is a blazing, surging account of the finale. It is interesting to compare this performance with Wand�s 1982 (studio?) recording with the NDR Symphony Orchestra. That too is deeply satisfying and the German players are by no means disadvantaged by comparisons with their illustrious American colleagues. I noticed no significant differences of interpretation though the Chicago performance is some two and a half minutes longer overall. The NDR performance sounds a bit more mellow but that, I think, is due to a combination of two factors. Firstly, the sound of the NDR recording is a touch more recessed, less closely balanced (which some listeners may well prefer). Secondly, there is no doubt that the Chicago ensemble, largely the product of training by Reiner and Solti, was then a more "up front" band (by which I do not mean "aggressive"), producing a bright, forwardly-projected sound. These two factors, I think, combine to give this Chicago recording more bite and drive than its NDR predecessor. This Chicago performance is powerful and trenchant. It is also superbly played and the majestic final brass peroration, followed by the "dash for home" must have brought the house down at the concerts from which this recording derives. The disc is completed by a strongly characterized, weighty performance of the �Leonore� No 3 Overture. Tchaikovsky is not a composer with whom one would readily associate Günter Wand. This recording of the Pathétique is interesting but by the high standards of this boxed set it struck me as probably the least successful of the performances gathered here. Throughout the playing and interpretation are musical and thoughtful but I think one wants something more in Tchaikovsky. That "something" is intensity and, often, heart-on-sleeve emotion and it is in these crucial areas that Wand is lacking when compared, say, to the recording by Mikhail Pletnev and the Russian National Orchestra or, even more so, to the classic 1960 Leningrad Philharmonic performance under Evgeny Mravinsky. It is really at the start of the first movement development (8�56") that doubts begin. The strings don�t dig into the notes in the way that Pletnev�s players do. Turn to the Mravinsky version, however, and one is in a different world again. The adrenalin really pumps and there is a visceral excitement which is quite alien to Wand�s perception of the piece (or his player�s execution of it). Furthermore, Mravinsky�s white-hot intensity stems as much from the phenomenal articulation of his string section as from anything else. Frankly, the Wand performance sounds pretty tame beside this. Again, when the cathartic climax of the movement is reached, Mravinsky�s recording has one on the edge of one�s seat; the strings play as if their very lives depended on it while the brass sound like harbingers of doom. Wand�s performance is nowhere near this level. An unfair comparison? Perhaps, but commercial recordings have to be judged against the rest of the field. The second movement is nicely played thought I thought the tempo was just a mite sluggish. Pletnev is scarcely faster but he imparts more lift and delicacy. The subsequent march is alert and crisp, though once again I felt Pletnev has the edge. In the finale Wand refuses to wear his heart on his sleeve and his performance has a purity and nobility. This is impressive in its own way but I think it�s perhaps a bit too cultured and civilized. Once again Mravinsky is in a different league. His is a performance of shattering intensity, not least because he makes more of the dynamic contrasts than any other conductor I have heard. By the end of his account of the finale the listener is drained. Wand, for all his fine musicianship, can�t match this. His is a performance to respect whereas Pletnev�s is a performance to be thrilled by and Mravinsky�s is awe-inspiring. I suspect that, heard once in the concert hall, the Wand performance would be stimulating and refreshing but it is not one that really bears up well under the scrutiny of repeated listening. He is on much "safer" ground with Schubert�s �Tragic� Symphony. He is quoted thus in the booklet: "This symphony is really not tragic, but very beautiful � when it�s played correctly." Well, in my view it is indeed played "correctly" here. This is a charming, engaging performance in which the Cologne players respond enthusiastically. Everything about this lithe reading seems �right� and though it was undoubtedly prepared scrupulously it sounds wonderfully spontaneous. I particularly enjoyed the irresistible finale. I may have reservations about Wand�s Tchaikovsky but none whatsoever about this account of Bruckner�s Fourth. I bought this recording when it first appeared in 1998 and still believe that it is, quite simply, one of the finest, if not the finest version ever committed to disc. In fact, I can only think of one other reading which matches it: Böhm�s 1973 recording, with the VPO, of the Nowak edition of the score. If anyone seeks an example of Wand�s control of pace, dynamics and structure they need look no further than the first three minutes of the finale of this symphony. This passage is an object lesson in how to build Bruckner�s terraced climaxes through skill and patience. Thereafter, Wand charts an unfailingly wise and perceptive course through the long paragraphs of the finale until he and the Berliners reach the goal of the final peroration, which is delivered with matchless grandeur. This is a classic performance. Even in this box of top quality performances it is one of the highlights. Fittingly, the set ends, as it began, with Bruckner. The first CD contained what can seem to be Bruckner�s most intractable symphony; the last disc contains his most visionary, questing utterance. Both symphonies are difficult nuts to crack but in this set they both benefit from conducting of the utmost distinction and understanding. Like that of the Fourth Symphony, this recording derives from concerts given in Berlin�s Philharmonie in 1998. This performance shares all the same interpretative virtues and it too is graced by playing of aristocratic refinement. After listening to nine CDs, this tenth disc seems to me to offer a most appropriate summary of Günter Wand�s great strengths. Here once again we find consummate pacing; an acute sensitivity to dynamics and balance; a mastery of all the detail of the score; above all, a vision of the work as an entity and an absolute command of its structure. Like all the other performances in this set, this is a reading of certainty and conviction. All Wand�s musicianship is put firmly and exclusively at the service of the composer and his music. There is nothing flashy or attention seeking here; all that matters is the music itself. And how necessary is such an approach if a conductor is to bring off a successful performance of Bruckner�s last symphony. The Ninth is Bruckner�s most intellectually challenging score. Suffice to say that Wand rises to and meets every challenge and, with the outstanding players of the Berlin Philharmonic attentive to every nuance, he lays before us a reading which is compelling, lucid and magnificent. How appropriate that this marvellous collection of recordings should end with the incomplete completeness of Bruckner�s last symphony under the baton of one of that composer�s most doughty and effective champions. However, BMG have given us here a very full and generous view of Wand�s recorded legacy from the last three decades of his career. All the performances are fine ones, even if one or two are a little less successful than the rest. Several of the recordings are absolute winners. Wand obtains magnificent playing from the virtuoso ensembles of Berlin and Chicago, as one might expect. What is also noticeable, however, is that by dint of scrupulous preparation he draws fine playing from his two German radio orchestras. This, surely, is a testament to the fruits of long term conductor-orchestra partnerships of a kind we too rarely encounter any more. This box contains music making of great intelligence, depth and insight. You may not agree with all the interpretations and, according to taste, you may find some performances less compelling than others. However, it seems to me that what is on offer here is a collection of the highest distinction. I have not said much about the recorded sound. Partly that omission speaks for itself since it is the music making rather than the engineering which calls attention to itself and that, surely, is as it should be. However, listeners can be sure that the sound quality throughout is very good. BMG are to be congratulated on a fine tribute to a conductor of the first rank. 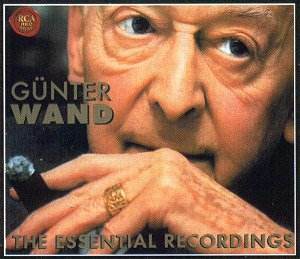 We are unlikely to see again the likes of Günter Wand so savour these fine recordings.